Associated Trainers provide operator training on all types of forklift truck, from the most common type, the counterbalance right through to some of the rarest container handling trucks used in British ports throughout the UK. Associated Trainers are accredited with ITSSAR (Independent Training Standards Scheme & Register). Novice operator:- For people who have never had any forklift truck experience. Experienced operator:- For people with some experience of forklift truck operations. Refresher training:- This training is for operators that have been previously trained and hold a basic operators certificate. This should be carried out at set intervals, as described in the company risk assessment for forklift truck operation. Conversion courses:- This course is aimed at anyone who has a certificate for a forklift truck and wishes to operate a different type of forklift. Most conversion courses take one day. All course lengths depend on the number and experience of the trainees. Maximum number of trainees per course is three. How often do I need to provide forklift truck refresher training? The length of a refresher training course will be set by assessment of the operators to identify shortcomings and any unsafe habits which need correction. It is not, therefore, possible to advise on the length of refresher training. However, it is unlikely that refresher courses of less than one day will be effective. We would always recommend the companies speak to their insurance companies as a precaution to ensure that any decision in this regard needs to be an informed one. i.e. To keep within their terms and conditions of your insurance policies. How long does a forklift truck driver's licence last? There is no such thing as a fork lift truck driver’s licence! There is no central licensing authority. Every employer has a responsibility, under Regulation 9 of the Provision and Use of Work Equipment Regulations 1998 (PUWER 98), to ensure that employees have adequate training before they use work equipment. The training required in order to operate most fork lift trucks is explained in the special Code of Practice detailed below. The operator should receive training on each type of equipment he or she may be required to operate. Such training may be provided by an in-house instructor or an external trainer. The training provider should then issue a certificate, or other document, giving details of the results of that training. This document is not a licence. The employer is required to give written authority for any employee to actually operate the equipment. If an individual document is issued this is the closest document to a licence, but it is not a licence. The employer alone will determine how long this authority remains valid but it is good practice to ensure that the performance of all operators is formally monitored. Adequate training means sufficient for the job which, for fork lift truck operators, will be measured in days rather than hours. As well as being a legal requirement there are sound safety and commercial reasons for ensuring that operators are properly trained. Lost time due to injury has financial implications as do damaged goods, buildings and trucks. Skilled operators have fewer accidents. Basic Training: The basic skills and knowledge required for safe operations. Specific Job Training: Knowledge of the workplace and experience of any special needs. Familiarisation Training: Operation on the job under close supervision. 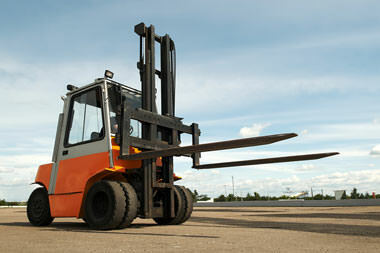 Different training will usually be required for different types of fork lift truck. On completion of training the operator will be given a certificate. This will show the type of truck that he or she may operate. Hand pallet trucks, or rather their operators, are responsible for many accidents in the workplace. Training requirements should not be underestimated. Regulation 9 of the Provision and Use of Work Equipment Regulations 1998 (PUWER 98) makes it very clear that an employer must provide adequate training for all persons who use work equipment. This includes training in how the equipment should be used, the risks involved and precautions to be taken. The same regulation makes it clear that those who supervise or manage the use of such equipment must also receive adequate, similiar training. All the various types of hand controlled pallet trucks would fall into this category, from the simple manual pump truck through to quite complex electric counterbalance stackers. The degree of training required, and the time it will take, will vary according to the type of equipment and the tasks to be performed. For the more basic equipment it may be possible to provide in-house training. This still needs to be properly organised and formally recorded.